If i was just given the container specification which is the shape of base is triangle, the height of box 40 in and the volume 720 cu in. the question is what dimensions were necessary for you to deteremine before you could build your box. How did you find the missing dimensions? Let’s assume that the sides of the box are vertical. In that case, the volume of the container would be the area of the base times the height. Since we know the volume is 720 cu. in., and the height is 40 =n, then we know that the area of the base is 18 sq. in. = 18*40=720). We don’t have enough information to find the lengths of the sides of the container’s triangular base. There are many shapes of triangles whose area is equal to 18 sq. inches. We would need to know the lengths of at least two sides of the base of the container, plus the angle formed by these two sides. We can then use the cosine rule (see below) to figure out the required length of the third side. 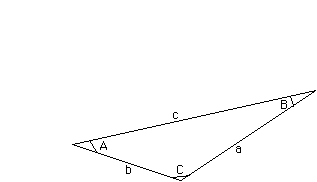 In the triangle below, the three sides have lengths a, b and c. Angle A is opposite side a; similarly for B and C.
This allows us to work out the required length of the third side of the triangle if we know the length of two sides and the angle between them. Posted in 10th Grade, Geography, Homework Answers, Math Answers. This entry was posted on Friday, July 23rd, 2010 at 2:36 am and is filed under 10th Grade, Geography, Homework Answers, Math Answers. You can follow any responses to this entry through the RSS 2.0 feed. You can leave a response, or trackback from your own site.